Dr. Blackmore is the Director of the Center for Health Services Research, Virginia Mason Medical Center, Seattle, WA; and Dr. Mecklenburg is the Medical Director, Center for Health Care Solutions, Virginia Mason Medical Center, Seattle, WA. Healthcare costs continue to increase in the United States (U.S.), consuming an ever-greater portion of the gross domestic product. Current estimates are that >17% of the U.S. GDP goes to healthcare.1 This is more than twice the developed country average of 8.3% and50%> Switzerland, the next highest. In 2003, the World Health Organization issued a report grading the quality of healthcare in different countries around the world. The U.S. ranked 37th overall, ranking 47th in life expectancy.2 This is worse than all of the Nordic countries and nearly all countries in Western Europe. In a paper in the New England Journal of Medicine in 2010, Swenson and colleagues compared the current state of health-care in the U.S. to manufacturing in the British Isles prior to the industrial revolution.3 In effect, current healthcare is a cottage industry with individual artisans providing customized care. The system is fragmented, quality is variable, and variation is tremendous. Data suggest that only 60% of the care for which there is strong evidence is actually provided to patients in the U.S.4 In contrast, 20% or more of the care is unnecessary, adding cost and potentially causing detrimental outcomes. Radiology is a strong contributor to increasing healthcare costs. The growth rate of advanced imaging procedures exceeds that of medical cost increases overall.5,6 Computed tomography (CT) is now the largest source of medical radiation and the most rapidly rising.7 Further,there is >50% variation in imaging rates between U.S. cities and regions.8 Increased awareness of radiation risk has led to increased scrutiny,particularly of CT, with current estimates that inappropriate utilization of this technology is on the order of 26%.9 The use of CT in the emergency department in particular is perceived as a major source of overutilization. The spiraling increase in imaging costs has caught the attention of governmental and private payers. Federal healthcare reform efforts include Centers for Medicare and Medicaid Services (CMS) demonstration projects on strategies for controlling imaging utilization. Intervention is also occurring at the state level. For example, Minnesota has joined with the Institute for Clinical SystemsImprovement (ICSI) on a statewide initiative to use a single vendor to provide imaging computer decision support for all providers.10 A recent law in the state of Washington provides for control of advanced imaging for individuals covered by state health plans and determining the feasibility of a single statewide solution for ensuring that advanced imaging is used appropriately.11 Commercial insurance companies have also taken an increasing interest in controlling advanced imaging with preauthorization schemes proliferating throughout the country. There are many good reasons for radiologists to improve the appropriate use of imaging, including the moral imperative to be a physician and to do no harm to patients; the business case for improved quality; and the professional satisfaction of reading only studies that add value.However, radiologists have traditionally served in a consultative role regarding imaging appropriateness, and have not necessarily positioned themselves to actively manage imaging. Further, for all radiologists—but particularly for single specialty radiology groups in private practice—optimizing the business performance of a practice may conflict with limiting imaging to clearly appropriate circumstances. Regardless, purchasers and health plans are clearly taking an active hand in imaging management, and will continue to exert more influence in the future. Less clear is whether radiologists and other physicians will take the lead to manage imaging, or if physicians will relinquish control over imaging to external entities. The objective of this paper is to introduce the choices and decisions that providers must make to implement a system to ensure appropriate use of imaging. Though radiologists may not be in a position to implement these approaches unilaterally, they do need to understand the relative tradeoffs to assume an active role in a decision-making process. Different solutions may work better in different settings, and we present the relative strengths and weaknesses of different approaches. The most important characteristic of an imaging utilization program is that it be effective and efficient. The program should not introduce delays in patient care. It should not add administrative costs for either purchasers or providers. Additional desirable qualities,delineated by Bernardy and colleagues, include that the system be prospective, transparent, evidence based, and unobtrusive to the doctor-patient relationship. Bernardy and colleagues also detail the value of a program being both educational and supportive of continuing quality improvement.12 Available imaging management solutions range from preauthorization programs to point-of-order decision support to post-procedure billing denial; they all have tradeoffs in all of the important characteristics. Defining the key questions of timing (point of control), extent (scope of control), and strength (degree of control) can be used to illustrate the fit of a particular imaging management approach to a given healthcare setting. As noted above, there are choices regarding when imaging utilization intervention can be performed (Table 1). Implementing controls prior to imaging include traditional preauthorization programs where permission from a third party is required before the study can be performed, as well as precertification programs where notification that the study is being performed must be provided to a third party, although actual permission is not required. Such programs can be highly effective. However, they lack the other desired characteristics. They are obtrusive: An additional disruptive step is required. In addition, denial of a preauthorization request potentially requires an extended or repeat visit with the clinician. Preauthorization systems are not efficient, as both the provider and the payer must hire staff to engage in the discussion of whether the imaging is appropriate and provide the necessary documentation. This decision-making process can consume substantial staff time and is expensive for both payer and provider. Preauthorization systems are seldom transparent, as they are usually based on proprietary third-party appropriateness criteria,which may be inconsistent across vendors. They may be evidence-based, but this can be difficult to assess given the lack of transparency.In addition, these systems are not educational, as the provider is generally not given an explanation for why the study is considered inappropriate and what might serve as an alternative. On the positive side, preauthorization programs are fairly adaptable and easy to implement for health plans and purchasers. Imaging control can occur after the procedure has been performed through denial of payment. Although the potential exists for payers to save money, this is, in many respects, the least desirable approach. Billing denial has no direct effect on unnecessary irradiation of the patient, and the financial consequences are borne either by providers who did not make the image ordering decision or by the patients themselves. Systems based purely on billing denial are often not transparent, are definitely intrusive, and are expensive and inefficient given the often cumbersome appeals process. Consistency is not guaranteed, as the criteria are not transparent and there is little opportunity for education. They may have positive attributes of adaptability and ease of integration with existing systems. Finally, imaging control can also recur at the point of order, meaning that the control step in determining whether imaging is appropriate occurs while the physician is making the decision to order the study. 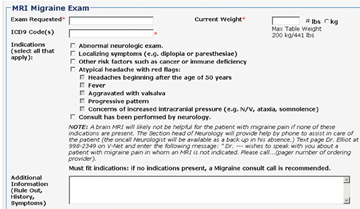 Point-of-order imaging management systems are generally built around clinical decision support systems (Figure 1) that provide immediate feedback to clinicians while ordering the examination. These prospective clinical decision support systems have many ideal characteristics. They are usually web-based or integrated into the institutional physician order entry system, and are generally transparent; the provider is able to see the imaging criteria when the order is being placed. They are performed at the point of care and so are less obtrusive as well as substantially less expensive than preauthorization systems. There is also the potential for education as the ordering physician may be provided with feedback on why an imaging study is or is not appropriate and what alternatives migh tbe provided. These systems are usually adaptable as new evidence comes online, and are, hopefully, evidence-based. Clinical decision support is the least obtrusive system, with highest acceptance among providers .10,13 Overall, point-of-order clinical decision support clearly comes closest to the ideal system for imaging management.12 Less clear is the effectiveness of clinical decision support systems, which will be discussed below. Imaging management may also vary in scope. A global approach addresses all imaging studies and indications. From a practical standpoint, even if this approach is limited to advanced imaging—CT and magnetic resonance imaging (MRI), there are still literally tens of thousands of indication/imaging procedure pairs. Unfortunately, the vast majority of these imaging/indication pairs will be without strong evidence or even consensus on whether imaging should be performed. However, several vendors now produce and maintain the required vast libraries of clinical decision support rules to drive the global approach. The hardware and software platforms to support this approach can be purchased for any size enterprise, though the cost and challenge of integration into the existing IT infrastructure may be large. An alternative approach is to target imaging control to the limited set of imaging/indication pairs where there is strong evidence that imaging should be performed. Fortunately, the availability of evidence overlaps with a number of common indications where imaging use is highly variable and likely over-utilized. Particularly in young and commercially insured populations, high utilization costs occur in high frequency, low severity conditions. Thus, there is a potential for a high overall impact through using a targeted approach to areas of high utilization and strong evidence. Examples include lumbar MRI for low back pain, brain MRI for headache, head CT for headache, sinus CT for sinusitis, and selective applications of chest CT, including CT pulmonary angiography. The targeted approach allows for organic development of a system within the pre-existing IT infrastructure, potentially at little cost. An additional choice that must be made in a point-of-order system is the strength of the barrier to inappropriate utilization. Clinical decision support can be used in a purely educational manner, with information provided to ordering clinicians regarding the appropriateness of a study, but no barrier to ordering inappropriate examinations. The presumption is that the educational effect of the critical decision support combined with the ability of the managers of the system to track the ordering behavior of providers (sentinel effect) would cause more appropriate imaging use.Alternatively, a strong barrier or “hard stop” can be enforced, where imaging requests that do not meet evidence-based criteria can be blocked.The term for this approach at Virginia Mason is “mistake-proofing,” since this method does not permit a mistake to occur in ordering of advanced imaging. An intermediate stage would be to require additional steps to order imaging when criteria are not met, but still allow inappropriate ordersto proceed (“soft stop”). How effective is imaging control? In Minnesota, ICSI led a pilot program in advanced imaging clinical decision support in 5 large provider groups. Following implementation, the imaging growth rate dropped to virtually 0%.10 However, the ICSI data are confusing, as imaging growth appeared to drop prior to implementation of decision support. Also, there was concurrent implementation of a preauthorization program at many sites that confounds the results. The targeted clinical decision support has been used at Virginia Mason Medical Center in Seattle, WA, focusing the clinical decision support system only on selected areas of high imaging volumes, strong evidence or consensus around appropriateness, and potentially high overutilization. The Virginia Mason system was developed organically within the computer order entry system. A hard stop was employed whereby requests for imaging that did not meet evidence-based criteria were not permitted to proceed. The results of this program were more profound than that observed in the MGH and Minnesota experiences. At Virginia Mason, there was not simply a decrease in the rate of growth, but rather a sustained 20% to 25% decrease in imaging rates in the target conditions.15 The system was also low cost, not requiring the purchase of a commercially available system, or the development of thousands of individual decision rules. The decision rule set used byVirginia Mason is freely available (https://www.virginiamason.org/body.cfm?id=5620). In addition, at the Everett Clinic in Washington State, the targeted approach to clinical decision support was used in combination with institutional process improvements to focus on decreasing inappropriate imaging. At the Everett Clinic, imaging utilization for MRI lumbar spine, CT sinus, and CT and MR brain for selected clinical conditions dropped by 14% to 41% after the intervention (K. Weaver, MD,personal communication). Though small, single institution reports, these results do suggest that the targeted approach combined with a hardstop is substantially more effective in eliminating imaging overuse than the global commercial systems based on provider education. Proactive involvement of radiologists facilitates selection of more ideal clinical decision support systems rather than the more traditional,and intrusive preauthorization and billing denial. However, even within clinical decision support systems, there are trade-offs between global and targeted systems, as well as between purely educational systems or systems that actually block inappropriate utilization. These choices will vary depending on the individual practice and local medical climate. 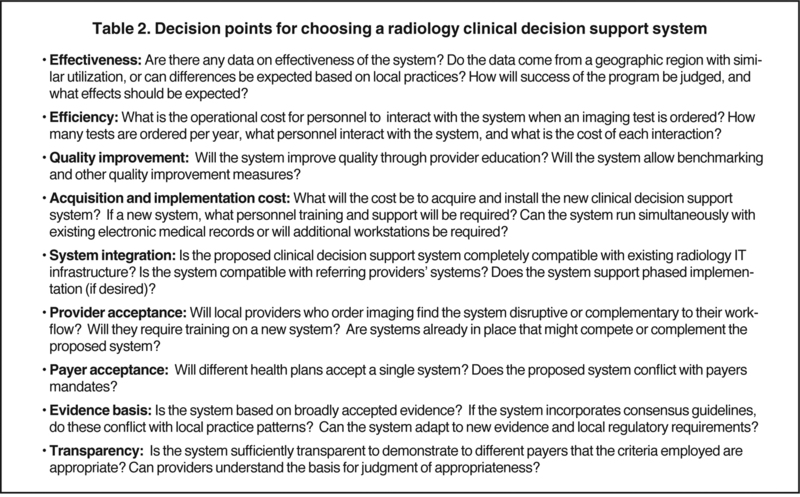 Table 2 delineates a series of questions that radiologists can use to guide their choice of imaging utilization approaches. The development of point-of-order clinical decision support now offers an accepted and relatively easy-to-implement method for imaging management, preferable to the more established and common pre-authorization approach. Additional choices within clinical decision support systems, between global versus targeted, and educational versus “mistake-proofed” methods may depend on the organizational interests of providers. However, the targeted, “mistake-proofed” point-of-service method is most aligned with medical evidence, and likely provides the greatest effectiveness in reducing inappropriate imaging for high-volume conditions of high aggregate cost for purchasers.This method is clearly less costly in terms of provider time per imaging study. Commercial global systems cover a broader array of medical conditions than the targeted approach and provide opportunities for provider education. Further, global commercial systems without actual barriers to inappropriate ordering may require less effort in securing acceptance of providers. However, such systems are generally less effective, are more costly to install and maintain, and are less amendable to modification by providers. The consultative role of the radiologist in determining when imaging is appropriate has always been a part of our practice and training.However, increasing emphasis on appropriate imaging mandates radiologist participation in developing methods of systematic assessment and potential denial of imaging requests. This active control of imaging to eliminate unnecessary testing is challenging to radiologists as well as referring clinicians, but appears inevitable in the context of increasing healthcare costs and overutilization. We greatly appreciate the collaboration of Kelly Weaver, MD, of the Everett Clinic in Everett, WA, for sharing imaging utilization data. Truffer CJ, Keehan S, Smith S, et al. Health spending projections through 2019: The recession’s impact continues. Health Aff. 2010;29:1-8.
WHO. The World Health Report 2003: Shaping the future. New York: United Nations; 2003. Swensen SJ, Meyer GS, Nelson EC, et al. Cottage industry to postindustrial care: The revolution in health care delivery. N Engl J Med. 2010;362:e12. McGlynn EA, Asch SM, Adams J, et al. The quality of health care delivered to adults in the United States. N Engl J Med. 2003;348:2635-2645. Levinson DR. Office of the Inspector General Report: Growth in advanced imaging paid under the Medicare physician fee schedule. Washington, DC; 2007. Smith-Bindman R, Miglioretti DL, Larson EB. Rising use of diagnostic medical imaging in a large integrated health system. Health Aff. 2008;27; 1491-1502. Hricak H, Brenner DJ, Adelstein SJ, et al. Managing radiation use in medical imaging: A multifacted challenge. Radiology. 2011;258:889-905. Parker L, Levin DC, Frangos A, Rao VM. Geographic variation in the utilization of noninvasive diagnostic imaging: National Medicare data, 1998-2007. AJR Am J Roentgenol. 2010;194:1034-1039. Lehnert BE, Bree RL. Analysis of appropriateness of outpatient CT and MRI referred from primary care clinics at an academic medical center: How critical is the need for improved decision support? J Am Coll Radiol. 2010;7:192-1977. Improvement IfCS. High-technology diagnostic imaging intitiative executive summary. Bloomington, MN: Institute for Clinical Systems Improvement. Bernardy M, Ullrich CG, Rawson JV, et al. Strategies for managing imaging utilization. J Am Coll Radiol. 2009;6:844-850. Sistrom CL, Dang PA, Weilburg JB, et al. Effect of computerized order entry with integrated decision support on the growth of outpatient procedure volumes: 7-year time series analysis. Radiology. 2009;251:147-155. Vartanians VM, Sistrom CL, Weilburg JB, et al. Increasing the appropriateness of outpatient imaging: Effects of a barrier to ordering low-yield examinations. Radiology. 2010;255:842-849. Blackmore CC, Mecklenburg RS, Kaplan GS. Effectiveness of clinical decision support in controlling inappropriate imaging. J Am Coll Radiol. 2011;8:19-25. Bowen S, Johnson K, Reed MH, et al. The effect of incorporating guidelines into a computerized order entry system for diagnostic imaging. J Am Coll Radiol. 2011;8:251-258. Taking charge of imaging: Implementing a utilization program. Appl Radiol.